Do you want to learn to play the piano? Looking for the right piano teacher for beginner piano lessons near you? Or perhaps you are already playing and are looking for intermedIate or advanced piano lessons with an experienced piano tutor? How about getting in touch with one of our experienced piano teachers! Learning to play the piano with the piano teachers at MusicTutors.co.uk is a great idea. Our piano tutors are skilled and experienced teachers as well as professional musicians, who have all been approved by our team through a stringent recruitment process. Whether you are looking for piano lessons for beginners, or intermediate piano lessons, we can find the right piano tutor for you! Flexible Solutions for Piano Lessons in Sheffield at MusicTutors.co.uk! At MusicTutors.co.uk we understand that life can be crazy. That's why many of our piano tutors are willing to travel to your own home to offer piano lessons, and some piano teachers offer the option of learning in a studio/rehearsal space. The sky is the limit when it comes to tailoring a learning experience with our piano teachers that meets your ambitions and needs for piano lessons. We understand that for some people, learning to play the piano is something that needs to happen at the same time, same place, every week. In this instance, our team of professional piano tutors will be able to provide piano lessons for you to fit in with the spaces you have in your schedule. However, we also understand that for other people, schedules are more fluid and piano lessons will need to happen at different times during an ever changing schedule. Our team of high-quality piano teachers can also work your piano lessons into this kind of schedule as well at no extra charge! musictutors.co.uk wants as many people as possible to be able to enjoy learning to play the piano and so we offer piano lessons with a professional piano teacher as flexibly as we can! Do I Need My Own Piano for Piano Lessons? There are multiple things to take into consideration when purchasing a piano – should I buy an acoustic or digital piano? Upright or grand piano? How much do I need to spend? Here are some things our expert piano teachers recommend you take into account when choosing your piano. Your piano lessons will be so much more meaningful if you have the right piano to practice and perform on. Our piano teachers say the sound of a digital piano is produced electronically, so it does not need tuning. This can save you money in the long term, leaving more resources free for extra piano lessons! One piano teacher comments that most digital pianos have the option of plugging in headphones. This way, you will not disturb anyone while playing, and you don't have to feel self-conscious about practising before your piano lessons! There will often be a metronome built-in which can help you practise playing in time. Often, your piano tutor will like you to practice scales and exercises and even pieces on the piano alongside a metronome. This dramatically increases your sense of time, pulse and rhythm - crucial skills for anyone learning to play the piano. The metronome helps bridge the gap between practice and piano lessons, where your piano teacher will be there to guide you on these important skills. Most digital pianos are lighter than acoustic pianos and are easier to transport – some can even be disassembled. For the gigging pianist, a stage ready digital piano, complete with weighted keys and stand but without the traditional cabinet associated with the piano is considered a standard piece of kit. For your piano lessons, a stage piano will be OK if you are short of space in your own home. If you go to a tutors studio for your piano lessons, more often they will have a cabinet to go with the weighted keys of the instrument. Ask your piano teacher for more information. Digital pianos are often much cheaper than acoustic pianos. Cost is of course a significant factor to consider in any instrument purchase. Your piano teacher may be able to advise how to get the most from your budget. The sound of a digital piano is created electronically rather than mechanically, so the player has less control over the tone produced by the piano player. In the beginning stages of learning to play the piano, this may not matter so much. However, your piano teacher may comment that the greater the demands of the piece or the longer that the student has had piano lessons, the more likely the piano student will find frustration with the electronic reproduction of piano tone. For other piano tutors the type of instrument doesn't matter as much as the time and focus spent playing it! The sound is not quite the same as an acoustic piano - however the more expensive the piano, generally, the better sound you get. Your piano teacher might have a high quality instrument you can try out. In the higher end of digital pianos, often the worlds very best acoustic pianos are used as the basis for the digital sound, meaning the harmonics and complexities in the real piano tone can be heard, although as any student of the piano who has heard a concert grand in an acoustically designed concert hall will tell you - nothing beats the real thing! In your piano lessons, try comparing the sound of a digital and acoustic piano, assuming your piano teacher has both available of course! The action (how the keys respond and feel) on a digital piano is lighter than on an acoustic piano. This can make it difficult to transfer your playing to an acoustic, and can mean your piano technique isn't as developed. On this note - it's definitely worth paying enough to get a digital piano with weighted keys, that way at least it will feel more similar to an acoustic. piano. A piano tutor at musictutors.co.uk will be able to pass down a wealth of knowledge and experience on technique in your piano lessons. Learning to play the piano is much a physical task as it is is a mental or musical one. Understanding the action of your own piano is a crucial part of learning to play the piano and developing a solid technical basis is one of the core reasons for seeking out the right piano tutor for your piano lessons. Your piano teacher will be able to lay out a plan for improving or embedding a good music technique in your first piano lessons. As the sound is produced acoustically, you are closer to the source of the sound when you press the key and have more control over tone and volume; something your piano teacher will be most pleased with - both in your piano lessons and also when your practice at home. Practising technique is best done on an acoustic piano - the creation of tone depends on your control and finger strength together with the balance in your forearm. Your piano tutor will be able to advise you on this in your piano lessons and offer a range of exercises designed to improve and automate this ability. If you were blindfolded, do you think you would be able to tell the difference between a beginner piano student and a professional piano teacher doing something as simple as playing the note middle C? Perhaps unsurprisingly you would! Technique and the way you approach playing even the simplest of things on a piano is a life times worth of hugely enjoyable work, something made all the more so by enlisting the services of a piano tutor for your piano lessons, someone to be by your side during the trials, tribulations and celebrations on the journey of learning to play the piano. 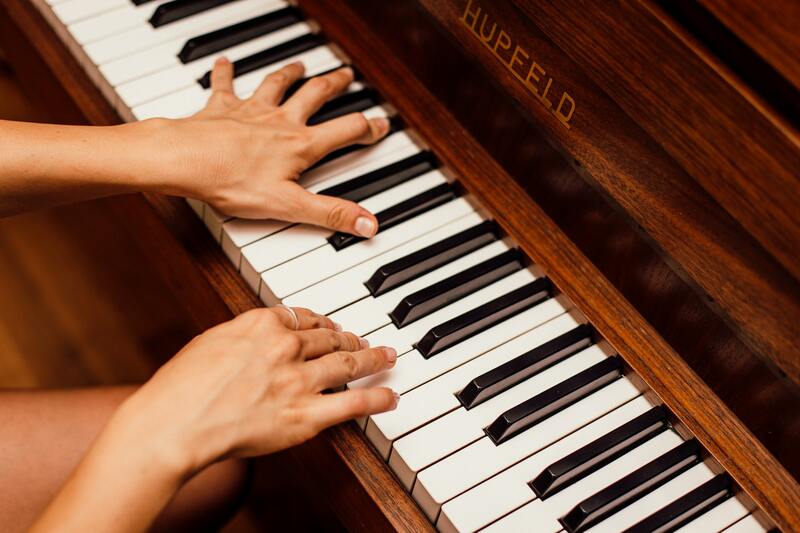 Our biggest tip in this article is to enjoy piano lessons with a professional piano teacher. As your piano teacher will tell you, acoustic pianos need to be tuned. This should always be done by a professional piano tuner. Most likely your piano teacher will not be able to do this for you and certainly it's not normal for this to happen in your piano lessons. It's worth considering this added cost. When your piano is new, you should have it tuned at least twice a year for the first two years, and after that just once a year, regardless of how often you practice piano or have piano lessons. Your piano teacher may well be able to point you in the direction of a great piano tuner. Acoustic pianos are difficult to transport. Many a piano has been damaged in transit by trying to cut corners and save costs. It is most definitely a job for the professional and should not be undertaken by an amateur, no matter how keen and no matter how numerous or strong their friends are! Your piano tutor will be able to recommend a local firm who can undertake the logistics of piano removal and we sincerely hope you take this advice onboard - for the sake of pianos everywhere! Acoustic pianos are more expensive than digital pianos. Although the burgeoning second hand market in pianos and the increase in popularity of digital pianos means that occasionally a bargain can be found, more often an acoustic piano of quality will cost more than a digital equivalent. Your piano teacher will be able to recommend a local dealer or music store who can help advise on the best places to purchase an acoustic piano near you. It's not unusual to discuss a prospective piano purchase in piano lessons. It's an important decision that will also have an impact on future piano lessons so your piano teacher will want to make sure you make the right decision! How old Should My Piano Be? In modern piano stores, the instruments are seldom more than 10 years old – and therefore in good shape. How much a piano wears over times varies greatly. There are some makers who are known for their quality e.g. Steinway, Bösendorfer and Fazioli. These are worth considering. If you are buying a second-hand piano it is more likely to be an older instrument and you should be aware that the price is likely to match the condition of the piano. It is still possible, if looked after, to learn to play piano on an instrument 50 or even 100 years old. The key thing is understanding the maintenance and tuning history of the piano as best as you can. Your piano tutor will be able to advise on the tone and general condition of the piano you're looking at in your piano lessons and many of our piano tutors will be happy to spend some time assessing the quality of the instrument you have chosen to learn to play the piano on. Ask your piano teacher for specific advice when you need it. How Much Will It Cost to buy a piano? Price Range 1: Digital piano. Price range: £200-£1000 Digital pianos are great for beginners, for players who are looking to play keyboards rather than piano, and for anyone who doesn't have room in their house for an acoustic piano. It's possible to have piano lessons on an instrument in this price range as well. If it has weighted keys, your piano teacher will be happy! Price Range 2: Acoustic piano. Price range: £500-£5000 Acoustic pianos are great for beginners to advanced players. Your piano teacher can give advice on how to proceed. Price Range 3: Grand piano. Price range: £5000-£50.000 Grand pianos are wonderful instruments if you have the space in your home. Here you get a whole extra range of tone and volume, by adjusting the lid. Our piano teachers love giving piano lessons on these instruments but they are by no means essential for piano lessons to take place. Whereabouts do you Want to Take Piano Lessons? Not Sure Piano lessons are for You? For many, the piano is the gateway into a lifelong musical journey. It is recommended that all musicians learn at least a bit of piano and therefore take some piano lessons, or perhaps have piano as a second instrument. It can be really helpful as a tool for instrumentalists to get a better grasp on music theory as all the notes are laid out in front of you - you can easily see how triads, scales and different inversions are made up. Piano teachers are able to express these theoretical patterns simply and clearly in piano lessons thanks to the clear visual layout of the piano. In addition, the piano gives you endless musical possibilities as you can play chords and melodies at the same time. This means the piano sounds fantastic on its own, as well as accompanying others. Also, the piano is used widely in a huge array of genres. It's truly a universal instrument. What we highly recommend however, is the you find the right piano tutor to take piano lessons with. We think we have assembled the best team of piano teachers in the country. Book today for 50% off your first piano lesson. The piano works like a percussion instrument. Ask your piano teacher to show you. The notes on a piano sound when a hammer strikes the strings inside the cabinet - the hammer itself is set in motion by the player pressing a key, and the player can determine the volume of the notes depending on how hard the key is pressed. Vibrations in the strings are then amplified by what is called a soundboard. The soundboard is a thin sheet of wood inside the piano - this allows us to hear the notes that are pressed. Your piano teacher will be able to show you this process in your first piano lesson. WHen you take piano lessons with a professional piano teacher, you can expect to begin to understand a little about the geography of the piano. The piano consists of black and white keys. The keys on a piano each represent a different note, and between each note is a semitone. Pictured is an octave - C to C, 12 semitones. Black keys represent sharps/flats, and white keys represent 'natural' notes. The whole piano is made up of these notes (C-C), at higher and lower octaves. Generally there are 7 octaves total on a piano. In your first piano lesson, ask your piano tutor to explain the range and sound of the piano, going up through the octaves. You can control the length, volume and articulation of a note by pressing the key differently - for a staccato note, press the key with power, and lift your finger as soon as the note has sounded. For a legato note, press the key with less attack, and hold your finger there to sustain it for as long as necessary. For a soft, quiet note, press the key with less power, and for a louder note, approach the key with more power. Taking piano lessons regularly with an expert piano tutor means that soon these terms snd different ways of producing tones on the piano will soon be second nature to you, both inside your piano lessons with a piano tutor and also whilst at home practicing. Fairly near the beginning of your piano lessons, your piano teacher will show you the pedals and how they work. When sitting at the piano you will have some pedals at your feet. Most acoustic pianos have 3 pedals (pictured above), from left to right: soft, damper, sustain. The 'soft' pedal (Una Corda pedal) is used in many pieces to create a gentle tone for a specific section. The 'damper' pedal, also known as the 'practise pedal', is used when you want all of your playing to be dampened, or soft, perhaps for practise purposes - on most pianos, you can press this pedal and push it to the left to keep it locked down for as long as you need. The 'sustain' pedal is probably the most frequently used pedal - it's written in notation with a square bracket underneath the appropriate section. It's used to sustain the notes you've played even after you lift your fingers from the keys - most commonly used for smooth transitions from bar to bar. Taking piano lessons with a proffesisonal piano teacher will help you understand the different pedals and how they are best used when learning to play the piano. Just ask your piano tutor for a demonstration! The piano is one of the main instruments capable of producing chords, so it's useful to ask your piano teacher for help in understanding chords and chord symbols when learning to play the piano. Depending on what genre you plan on pursuing, reading chord symbols could be helpful, as could reading chords from sheet music. Pictured above are some notated chords, with additional chord 'symbols' above (the letters). Again, ask your piano tutor if you get stuck. If a chord is followed by 'm', like the middle two chords are, as your piano teacher will tell you it means it's a minor chord. The other chords are not followed by 'm', and so are major chords. This chord sheet is typical of the kind of material you might cover in your piano lessons. Your piano teacher, especially if they have a jazz or pop background, will be able to help you understand chord progressions and even how to improvise over the top of chords. Just ask your piano tutor for more information in your piano lessons. A third is so called because it is the third tone up from the tonic. The third is the note that colors the chord - if the third is flat, this makes the chord minor, for example. A fifth is so called as it is the fifth tone up from the tonic. Piano lessons are the perfect way of improving your knowledge of scales and the theoretical building blocks of music. Just find the right piano teacher and soon you'll be able to play different types scales, arpeggios and chords. If we start on the first chord - C. Take C as number 1, then try placing 3 and 5. If we count from C - C 1, D 2, E 3, F 4, G 5. So E is our third, and G is our fifth. Play 1 + 3 + 5 to hear the C major chord. Now if you change the third so it's E flat (Eb), we hear C minor. You can practise this for the other chords too - start by playing the tonic and the fifth and then try the minor and major thirds. See if you can hear the difference! Learning to play the piano means that over time you will build up a good knowledge of theory and harmony. Having a great piano teacher for your piano lessons makes this part of learning to play the piano a joy and not a nightmare as some people going it alone can find it! Many of our piano teachers also offer stand alone theory classes to help musicians of any instrument and level learn more about the building blocks of music. Once in while, consider taking a theory lesson with your piano teacher instead of or as well as regular piano lessons to make sure you develop all aspects of musicianship. Find Chords Easily on the Piano with This Hack! If you're struggling to find the third and fifth in your piano lessons, you can always count your way towards it. Your piano tutor will show you how! Start by playing the tonic, then count four seminotes from there (that's four keys - including black ones! ), not counting the tonic, and then you have the third! From the third, count three semitones (not counting the third), and there's your fifth! Your piano tutor will be able to illustrate this for you in a variety of different keys and inversions in your piano lessons. So 4 + 3 = major. If you want to find the minor third, just count three seminotes from the tonic, then count four seminotes from the minor third and you have your fifth. So 3 + 4 = minor! Learning to play the piano is as much about the ears as it is the hands. Your piano teacher will be be able to train your musical ear in your piano lessons to be able to recognize the difference between major and minor chords. It's another great thing about learning to play the piano, suddenly you'll find yourself listening to your favourite pieces of music with a new appreciation for the layers of harmony within them. Get in touch today to find the right piano teacher for you and just start playing! Piano lessons can be tailored towards your favourite pieces of music - it makes taking piano lessons a very enjoyable activity! Your piano tutor should do all they can to make your piano lessons based around what and how you want to learn! Want to test or improve your piano skills? MusicTutors has more articles coming soon where you can learn to play pieces from the classical and contemporary piano repertoire. Feel free to take this resources to your piano lessons as well. our piano teacher will welcome your ideas. It may sound like a cliché but the most important thing when learning the piano is to not lose sight of what made you want to learn in the first place. Follow that feeling you get when you hear the piano played beautifully, and strive for that. Enjoy playing - play something you like to play! Don't worry too much about what you're trying to achieve and stay relaxed – playing piano music should always be fun. Your piano lessons should be fun too! Your piano teacher will try to make you smile whilst you're struggling - the next breakthrough is just around the corner! It's really important to use your hands correctly to get the best possible sound from the piano. Technique is also important for avoiding injuries and strains when playing and practising. It often takes time to adjust and you have to be prepared for this. Using one of our great piano tutors is the best way to ensure technique is embedded from day one! The right piano teacher will be able to make this process fun and enjoyable - just like learning to play the piano should be! Your piano lessons should be something you really lookforward to in the week. 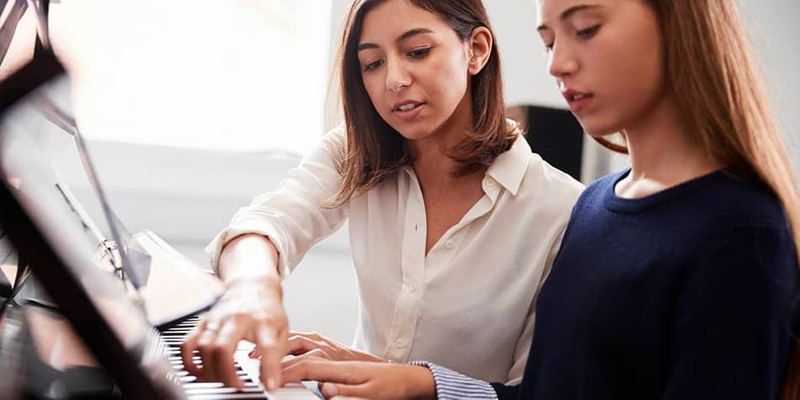 Practice is the same, piano lessons with a professional piano teacher should ensure that there is a strong connection between the work you do at home and the piano lesssons themselves. Begin by practicing the piano for short periods of time each day, instead of practicing for hours one day and then not practising for the rest of the week. Establish a good routine for piano practice and make sure your time on the piano is seen as an oasis of enjoyment in the midst of a busy day. Your piano tutor will be able to help you devise a schedule where, piece by piece, little by little, you gradually build up your skills on the piano inside and outside of your piano lessons. Learning to play the piano is as much about consistent hard, focused work as it is about musical flair or talent. The right piano teacher will be able to help you put in milestones, celebrating your achievements in your piano lessons and making all that hard work when you learn to play the piano feel worthwhile. It can be a good idea to schedule your piano practice. Here it is very important to make a realistic plan in line with how much time you have each day to practice. A busy day with children, school and the like might mean that an hour of practice would be too much! Talk to your piano tutor in your piano lessons and together devise a plan that is specific, targeted and achievable. It is a big part of the role of being a piano teacher to make sure that you understanding clearly what you'v been asked to work on before your next piano lesson. In most cases, 20 minutes of piano practice every day would be ideal. It can be advantageous to set a timer for 20 minutes to make sure you are able to focus on practicing, and not on going over time or practicing the piano too little. Some piano teachers will not like the idea of a timer but certainly for children learning to play the piano it can be a big help. Piano lessons are much more enjoyable if there is a sense of momentum that builds through successful piano pratice. This is true both for you and for your piano tutor. It takes time getting your fingers used to piano playing, so take the time you need. At some point you will crack the code and suddenly you will be able to play piano directly from the score – this is called primavista or sight reading. Never give up! To begin with, pick a piece on the piano, together with your piano tutor that might be a little easier to learn! Play what you know! This way, you can hear when your playing is not quite right! Talk to your piano teacher in your piano lessons about the kind of repertoire that will be right for you. A good piano tutor understands that learning to play the piano is an adventure that will look and sound different for every person. Make sure you have a piano teacher who can help you make the most out of your piano lessons. Take a leap into something difficult – and divide it into smaller pieces. Start by playing just the right hand part. Then try just the left hand. Finally put both parts together in your piano lesson! Ask your piano tutor for help in breaking down your favourite piece in this way. If you have any unanswered questions, ether about the piano, piano lessons, piano teachers or anything else, contact MusicTutors.co.uk - we are always ready to assist. We love helping match students with their perfect tutor. You can contact the office all weekdays between 10:00-16:00 by ringing us on 07946125613 or you can send us an email any time to [email protected]. We're looking forward to hearing from you! We're always looking for talented music tutors all over the UK. Think you're the right person for the job?